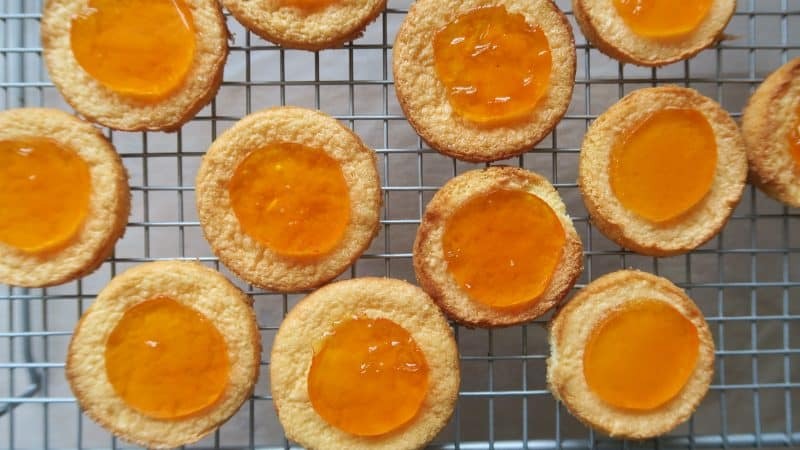 I’ve been waiting a long time for McVitie’s to bring out gluten free Jaffa Cakes, but seeing as this doesn’t look like it’s going to happen anytime soon, I’ve decided to make my own recipe. And you know what? 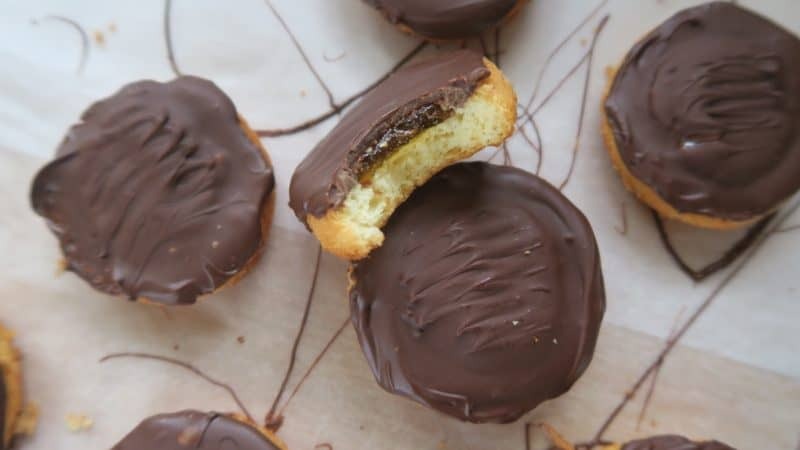 Making gluten free Jaffa Cakes is actually SUPER easy to do! I was so surprised at how quick and simple these were to make – I think the hardest bit is the pattern which, let’s face it, I still haven’t entirely mastered – but it doesn’t affect the taste so who cares!? 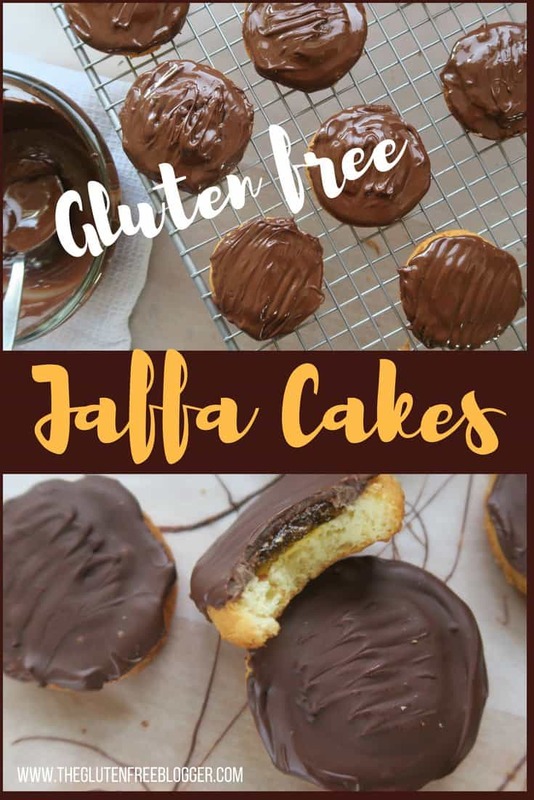 There are three parts to this gluten free Jaffa Cakes recipe – the orange jelly centre, the light sponge base, and the chocolate topping. All of which require minimal ingredients and are quick to make. And if you get your timings right, you won’t have to wait too long for each element to cool because they’ll all be ready at the right time! You could also really easily vary this recipe with lots of different flavours. For example, I was thinking of making some red ones with a strawberry jelly for Valentine’s Day, and perhaps some green-centred ones for a ghoulish Halloween treat! For this gluten free Jaffa Cake recipe I’ve obviously gone for the classic orange centre and dark chocolate, but don’t be afraid to mix it up. And while we’re on the subject of biscuit/cake lunchbox classics, why not give my gluten free Wagon Wheels recipe a go when you’re done? Sweet and tangy, these would be a great gluten free recipe to make with kids. They’d have great fun cutting out the jelly centres! 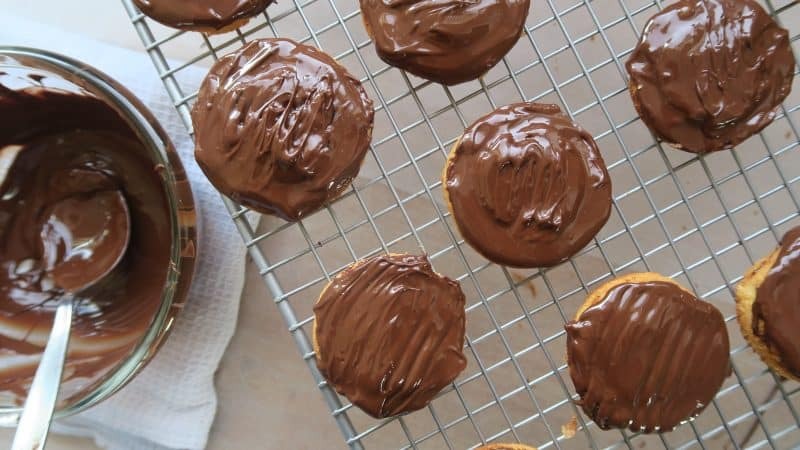 These would also convert easily to dairy free as well by using margarine instead of butter to grease the pan and making sure you have a dairy free chocolate for the topping. Let me know if you give them a go! This is a gluten free twist on one of my childhood favourites - Jaffa Cakes. With a light, spongy base, tangy orange jelly and a slather of chocolate, these gluten free Jaffa Cakes will take you right back! First make the jelly. Add the boiling water to the jelly cubes and marmalade and stir until dissolved. Pour into a 20cm x 20cm square baking tin and place in the fridge to chill until set (around 1-2 hours). Preheat the oven to 180'C. Using the butter, grease a small, 12-hole bun tin and set aside. Add the eggs and sugar to a mixing bowl and beat with a hand-held mixer for 4-5 minutes until pale and fluffy. Then fold in the flour, xantham gum and baking powder. Spoon approx 1 dessert spoon of the mixture into each hole, smooth with the spoon and then place the tray in the oven. Bake for 8-9 minutes. The buns are ready when they start to go golden brown and spring back when pressed gently. Allow the buns to cool in the tray before carefully removing with a knife. Cool completely on a wire rack. Once the jelly is set, remove from the fridge and turn out onto a piece of greaseproof paper. Using a cutter (or shot glass, like I did!) cut out small circles for each sponge base. These should have a small gap around them when placed in the centre. 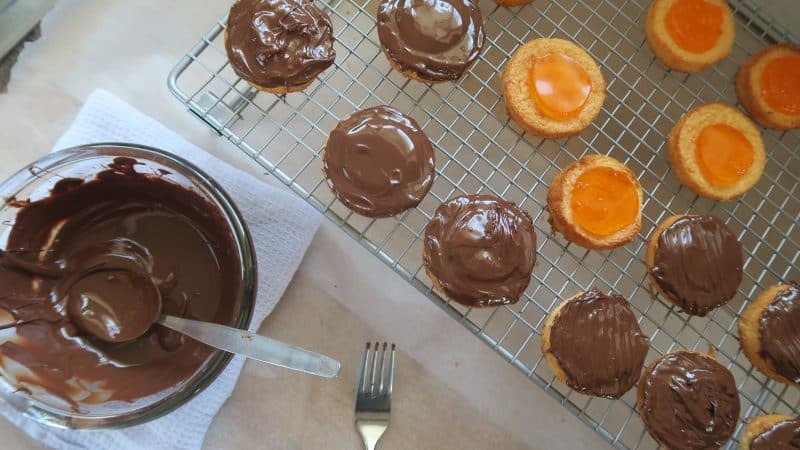 Melt the chocolate and spoon over each Jaffa Cake. Spread it out evenly over the top and then very gently drag a fork along the centre to create the classic Jaffa Cake pattern. Chill in the fridge to set for 30 mins - 1 hour before eating. If you do make this recipe please let me know! I’d love to see your photos using #theglutenfreeblogger, share them in my Facebook group or tag me on Instagram. And if you have any recipe suggestions, please let me know in the comments what you’d like to see next, I love a challenge! And if you like this recipe, why not try my gluten free millionaire’s shortbread, or my gluten free white chocolate and raspberry flapjacks for some more sweet treats! These look so good! Am I strange for having never heard of a Jaffa cake though? !